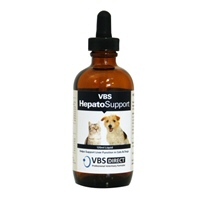 VBS Direct Ltd - VBS HepatoSupport Liquid - Innovative solutions for the veterinary professional. For animals less than 10kg in body weight, use the enclosed measured dropper to give 1ml twice a day with meals. For each additional 10kg of body weight give an extra 1ml twice a daily, or as recommended by your Vet.